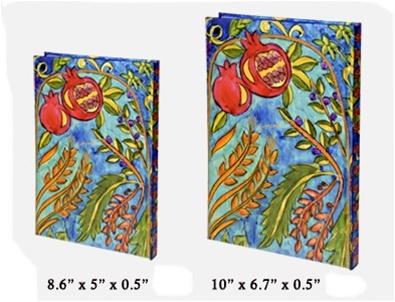 A beautifully bound diary with the distinctive art work of Yair Emanuel, featuring brightly colored vines and pomegranets. Perfect for that special gift. Available in: Large - 10" x 6.7" Small - 8.6" x 5"
953-L Emanuel Decorative Notebook Large - 10" x 6.7"
953-S Emanuel Decorative Notebook Small - 8.6" x 5"